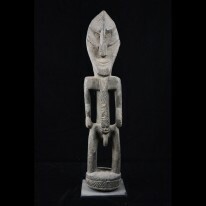 Middle Sepik River, Papua New Guinea, Batwing Protector Figure. This type of figure protects women when walking alone along jungle paths. It is 29 inches wide and 13.75 inches high. *The shipping cost quoted is via UPS. Should you want or need the item to be shipped via the Post Office please contact me. The cost to ship larger artifacts is considerably more than UPS in most cases.